Investors put their trust in Reits yesterday and sent the local market breezing past 3,600 points for its fourth straight day of gains. 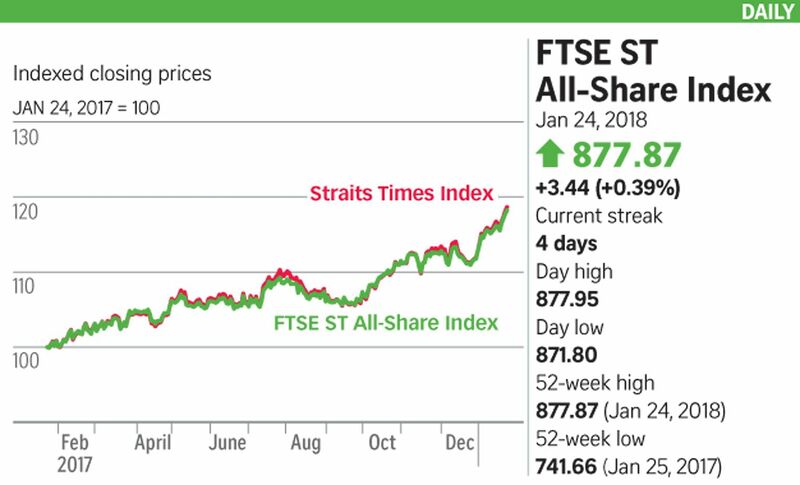 The Straits Times Index (STI) closed up 17.16 points to 3,609.24, its highest level in a decade, with positive sentiment surrounding the local Reit sector playing its part. CapitaLand Mall Trust, which lifted fourth-quarter net property income by 2.6 per cent, added three cents to $2.08, while Ascendas Reit, which announces results today, added one cent to $2.77. The three local banks were up, as was Singtel, which put on three cents to $3.64. Singapore Airlines gained 26 cents to $11.46 after Changi Airport posted record passenger numbers and unprecedented airfreight throughput for last year. But City Developments shed two cents to $13.28 on news that it has not yet met the conditional acceptance threshold for its takeover offer of London-listed Millennium & Copthorne Hotels, with the Jan 26 deadline fast approaching. Keppel Corp, which also releases results today, lost six cents to $8.63. Shareholders can find out just how much of a hit the blue chip has taken following its US$422.2 million (S$553 million) penalty for corrupt payments in Brazil. KGI Securities Singapore analyst Joel Ng noted, when the news broke last year, that "earnings could shrink by around 70 per cent" for 2017. UOB Kay Hian analyst Foo Zhiwei has forecast a less devastating decline of 1 per cent, at worst. Off the index, aluminium component manufacturer Midas Holdings was yesterday's most active, with 346.5 million shares done. It ticked up 0.8 cent, or 5 per cent, to 16.8 cents on news that it has seen a $7.7 million married deal of about 44 million shares. Consumer electronics and automotive supplier Memtech International jumped 14 cents, or 10.94 per cent, to $1.42 after CLSA initiated coverage with a "buy" call and a target price of $2, up on a Bloomberg consensus of $1.66. Elsewhere, Hong Kong's Hang Seng was up by 0.09 per cent to a new high after seven straight sessions of gains. "The Hang Seng is running its own race," wrote CMC Markets sales trader Oriano Lizza, noting that inflows from mainland China have been a boon for the index. "The recent Hong Kong Stock Connect deal in December is starting to bear fruit." he said. But a Bloomberg report said there are indicators that a pullback "could come sooner rather than later".